As journalist and Japanologist from Mainz/Germany I am researching and investigating about Japan’s no nukes movement and about the situation in Fukushima after the Fukushima Daiichi NPP accident in 2011 since almost seven years. In 2018 I published a German book called „Saynoara Atomkraft. Proteste in Japan nach Fukushima“ (Good Bye, Nuclear Power. Protest in Japan after ‚Fukushima‘). I want to express my gratitude for many help, support and advices I received from many people along my way. There is an English and Japanese abstract available on my website: https://www.andreas-singler.de. There is also a trailer on YouTube available with Japanese subtitles: https://www.youtube.com/watch?v=QxReFt6JLgI&t. The Tokyo Shimbun (2018 March 11th.) wrote an article about „Sayonara Atomkraft“ before it was published. 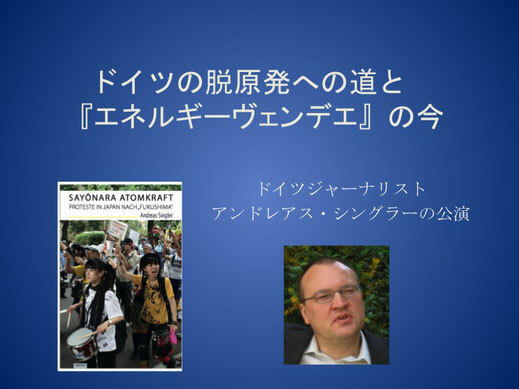 On my travels I sometimes met people who asked me about the situation of nukes and energy shift in Germany and Europe, and they encouraged me to offer a lecture about those issues in Japan. 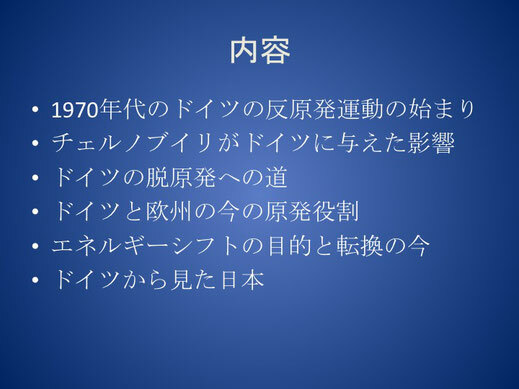 So recently I started to develop a PowerPoint presentation in (simple) Japanese language about Germany’s road to finish nuclear power, about the history of Germany’s no nukes movement, the Chernobyl accident's impact on Germany, and about energy shift, beside others. If there may be any interest in your area, organisation, or institution, please don’t refrain from contacting me and inviting me for a lecture. Duration of the lecture depends on the needs of the audience, may varie from 30 minutes to 2 hours. If there are special questions and needs about the contents, please let me know - in that case I may undertake special investigations in advance. My next travel larges from end of April to May 22nd. Later this year, September/October, I may be back in Japan again.